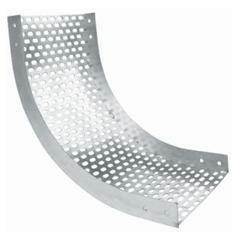 Bends for Cable trays are manufactured in the Factory for easy Installation at Site. The Bends are manufactured in various sizes as per specific Customer requirement. The Cable tray Bends are made to order. Leveraging our rich industry expertise, we have brought forward Cable Tray Bend for our revered customers. The offered tray bends are precision engineered and are regarded for their sturdy construction. With their durability, excellent resistance properties and fine finish, these trays are highly demanded among the customers.